I’ve always said that smart homes are not for me. I mean, what are light switches for? I don’t need an app to turn my lights on! And controlling things with voice commands and talking to a loudspeaker that is listening around the clock is truly weird and creepy. Or so I thought, until a few weeks ago. The house in which I live has some 120 years under its belt and has experienced more history than my family and I combined. It’s somewhat aged and long in the tooth. But to date, the house and our home never stood out as particularly smart, until now. It all began with an offer on Amazon Prime Day 2017. I actually had no intention of buying anything, just browsing a little. But the little Amazon imp didn’t want to cooperate and made a bold price reduction on the Philips Hue starter kit with three bulbs and a bridge. I gave it some thought and added it to my shopping cart... just to have a look; I mean, you can always return it. Then I added two dimmers, which you would need in an emergency anyhow, and, look! The Amazon Echo Dot is also pretty cheap! It’s an excellent fit, and I’ve always found it exciting. I’ll just take a look, briefly try it out, then send it back - that was the plan. Two days later, the delivery company was at my door and brought the packages. I excitedly unpacked them, took a quick look and checked it out to see how it all interacted with each other. I expected to do a lot of tinkering, which I could pull off - I am a professional, after all - but it would have also killed the fun from the onset. What can I say – I was wrong. 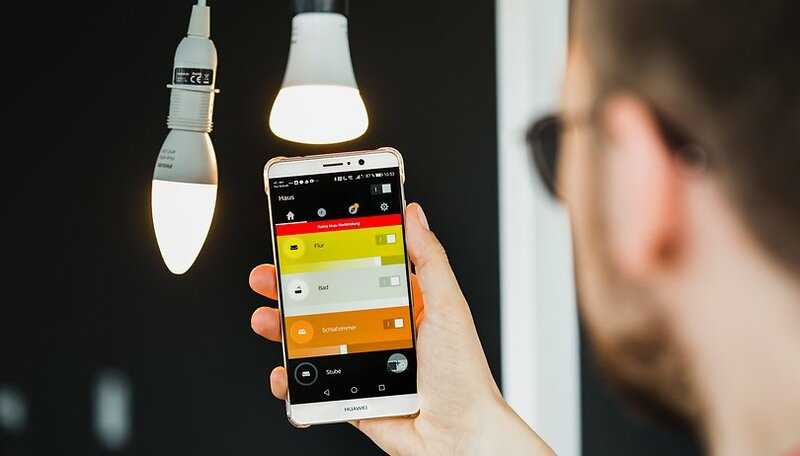 The Hue bulbs and the bridge can be connected, linked and configured so quickly and easily that it makes you wish all technical devices were designed that way. I admit that, to date, I have only dabbled slightly in lighting themes, moods and these kinds of things. But if you are a first-time owner of these nifty bulbs that can cover the entire color spectrum, you'll inevitably start to play around with the colors. You can do it quite easily via the Hue app, and even the so-called scenes are a pleasant change from “light on - light off”. I definitely like our living room better than how it was before. Shortly afterwards, I actually ended up with more just than the three bulbs in the starter kit. I needed a new ceiling bulb for the living room anyway, which is also awfully sleek and is made by Philips. And these portable Hue Go lamps are truly practical and I now use them all the time. Out of all the things I ordered, I have not returned a single item. Next came the Echo Dot. The power outlets near the router and TV were slowly filling up, so I have to connect a third power strip. While setup did take a bit longer with the Echo Dot than the Philips bulbs, I also managed to do it pretty quickly thanks to the excellent instructions. I connected the Hue bulbs via the appropriate skill in a mater of seconds. I was a bit skeptical as to what the rest of the family would think about this voice control. My wife wasn't too keen on the idea of having an always-on microphone in the living room, but just two days after Alexa moved in, the assistant was asked to play music in passing - something you can quickly do once you’re used to it! Even the three-year-old in the household now says “Alexa, off!” whenever the music is too loud. Well, Alexa still has problems understanding him, but it’ll get the hang of it. I am truly surprised at how quickly voice operation becomes second nature. As a linguist, I furthermore continue to be astonished at how well communication works with such a digital system - even if Alexa isn’t entirely perfect, it’s quite amazing. I am completely satisfied with the Hue bulbs and the Echo Dot; both have integrated themselves into my day-to-day life unbelievably quickly. So, everything is hunky dory, right? Actually no. I believe that I will take this smart home thing a bit further - at my wallet’s expense. I’ve been wanting to put up a couple of smoke detectors for some time now, and you could also use something that is networked... and aren’t there starter kits that include sensors for doors and windows? ...and a camera for the garden, maybe another for my front door... I mean, why not? What do you think? Have you converted your house into a smart home yet? What were your favorite things? Share your thoughts in the comments below! I'm having a hard enough time bringing myself to use Google assistant. I've experimented with Now, then Assistant through Nova extension of Google Now, and after reading about the Alexa case being used against someone in court, I'm even more concerned. I'm not sure your house qualifies as all that smart yet.